La Marelle Editions, a company making colorful and vibrant fashion accessories was created as a result of the meeting of Fabrice Bernetière and Pascale Nivet Bernetière (alias Miss Héloïse). Created in 2003, this French company has grown steadily, thanks to the success of the Miss Héloïse range of products. Melle Heloise is now a recognized artist and has been driving about 100 artists to create a world of fantasy through a wide range of fancy accessories. 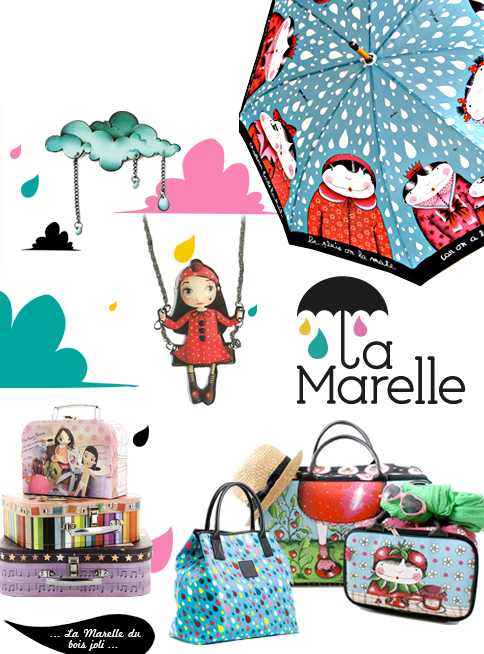 La Marelle now offers a wide range of bags, jewelry, accessories, stationery and postcards. It was all very well, but his charming little chatterbox’s hands were forever smudged with paint and he kept finding needles under the duvet – ouch! Of course that all made him rather grumpy. So, he suggested they set up a little company to produce her decorated china ware; and that way, his little darling would have time to go out and party! She thought he was joking, but her favorite grouch really meant it. Miss Héloïse (alias Pascale) liked the idea and instantly had another one: why not design a bag collection, and start her own fashion. So that was the start of La Marelle, a company of artists, with a dash of originality, making fun and vibrant fashion accessories. 10 years later, La Marelle has come a long way. Instead of their cosy little flat, where a staff of twelve were squeezed in, La Marelle has moved to a lovely big house, and produces the work of more than 40 illustrators. Miss Héloïse still has a multitude of ideas making her fingers twitch everyday, and her grumpy prince charming has turned into a somewhat silent M.D . Obviously they still manage to find things to squabble about, but now have plenty of time to party!